From helping to make stylistic decisions to providing a seamless breakdown service, carmakers are getting increasingly creative with their smartphone apps and connected platforms, as the latest offerings from Bentley, Mercedes and Vinli aptly demonstrate. Bentley's new app is designed to help clients customize and choose from the growing number of leather wood and paint palates on offer when specifying their luxury cars. When launched on a smartphone or tablet, the Bentley Inspirator app uses the device's front-facing camera to monitor the user's facial expression while he or she watches specially curated and developed static and video imagery. Based on what it interprets are the emotional responses, the Inspirator will generate a bespoke Bentley for the user, with colors, materials and textures that it believes will have the greatest emotional impact. Bentley says that the app uses cutting-edge facial and emotional recognition technology in order to design a car that's as individual as its owner. 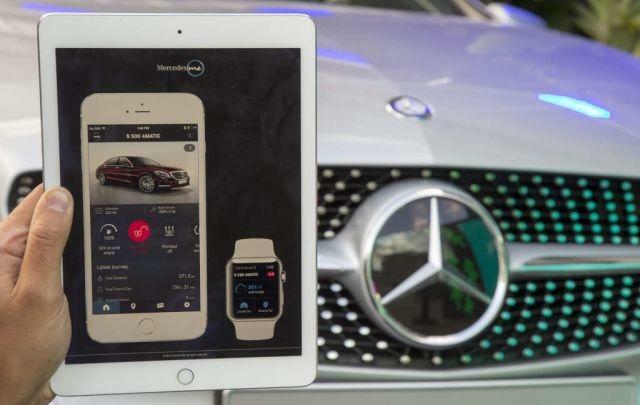 Like other smartphone and smartwatch apps for premium vehicles, Mercedes Me offers remote diagnostics information, live traffic updates and can do things like lock and unlock doors, close windows and activate alarms. Furthermore, users can access a host of the company's services such as maintenance and accident recovery. However, mobile device technology evolves far more quickly than that inside cars. To combat this, Mercedes also announced the Mercedes Connect Me adaptor. A little box that can be retrofitted to a host of existing Mercedes models built over the last decade. "Ever more customers wish to be linked up to their car. By extending the Mercedes connect me services to vehicles which have not been connect me-capable to date, we are now enabling millions of customers to fulfil this wish," said Ola Källenius, Daimler Management Board Member responsible for Mercedes-Benz Cars Marketing & Sales. "These Mercedes models can now also become part of the digital lifestyle and allow customers their own personal entrance into the Mercedes me world." Less of a standalone app and more of a suite of car-focused and related services, Vinli already offers drivers a diagnostics port adaptor that communicates with a smartphone app in order to track things like fuel economy and potential mechanical issues. However, at the Frankfurt motor show it announced it's bundling its tech into a new platform that carmakers are going to pre-install in new cars. "There is a huge need for automakers to offer enhanced connectivity capabilities that sync with the connected consumer's rapidly evolving environment," said Vinli's VP of Automotive, Mark Spain. "We are thrilled to be the first to present this holistic offering to automotive OEMs." The company has not yet confirmed which carmakers will be the first to bring Carport to their dashboards or given any idea of timeline.